Schlitz Beer No harsh Bitterness Ad 1946 This is a July 29, 1946 advertisement. It is a nice color ad from Schlitz Brewing Co of Milwaukee. pictures a brown bear wearing a night gown and sleep cap. 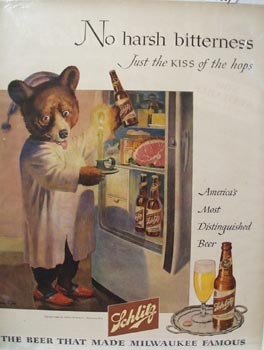 He is standing in front of an open refrigerator holding a candle in one hand and a bottle of Schlitz in the other. It reads, No Harsh bitterness, just the kiss of the hops. Bear looks like he is really eager to get that bottle open. In mint condition. This photo is taken through plastic and may show wrinkles or crookedness that is not in the ad. This magazine tear sheet measures 10 "" wide by 13 1/4"" tall. Items Similar To "Schlitz Beer No harsh Bitterness Ad 1946"